You Are Here: Home » Blog » car tires » When Should Car Tires Be Replaced? When Should Car Tires Be Replaced? Some questions in life have more than one answer: “”Who has the best pizza?”, or “How many times can you wear the same shirt?”, and of course “When should car tires be replaced?” You can ask anyone those three questions and you’ll almost be guaranteed to get a different answer every time, but only one of those questions can have significant impact on your life. And no, it’s not the question about the pizza regardless of how great it tastes. The question that can really have an impact on your life is “when should car tires be replaced?”, and it’s not enough to just accept the first piece of friendly advice you hear as fact; rather its best to consult the experts. There are two types of people in the world: people that replace car tires when they should, and people that replace car tires when they have to because of damage. Waiting to replace your vehicle’s tires until they are past their recommended mileage or waiting until there is some sort of problem is obviously not the safest method to take. And of course mileage is not the only factor to consider, in fact, tire condition should take precedence when replacing your vehicle’s tires. A lot of numbers are generally thrown around when discussing when should car tires be replaced whether it be every 25,000 miles, 30,000 or more. It’s generally a good idea to change your tires at these regular intervals but it might not always be necessary though. Many people are surprised to hear to not all tires need to be changed at the same time though; when making tires, manufactures use the Treadwear Number to assign a value to how long a tire will last. A tire with a treadwear number of 100 won’t last as long as a tire with a treadwear number of 400 for instance. If your only goal is maximizing the time that your tires will last then choose a tire with a high treadwear number, but there’s more to choose the best tire for your vehicle than it’s treadwear rating. Treadwear is something that is not necessarily tired to a tire’s price either a set of cheap tires can have a high treadwear number while others can have a low treadwear number; instead of price treadwear often varies depending on tire purpose. A tire’s treadwear is just one statistic that manufactures use to indicate the quality of the tire and if you would like to known more about about the To find out more about the Uniform Tire Quality Grading, or UTQG, then just check out our in-depth explanation. One of the most common and easiest methods that people use to check when it’s time to replace their tires is something called the penny test. 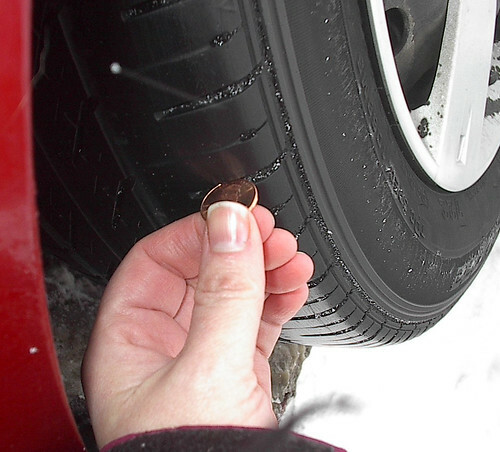 The penny test involves taking a U.S. Penny and putting it in between the grooves of your tires – if Lincoln’s head is not completely covered if when you place a penny upside down then it’s tire to replace your tires because there is less than 2/32 of an inch of tread depth left. Another surprising fact is that most of the United States and other countries it is illegal to drive with tires that have less than 1/16 or even a 2/32 of an inch of tread depth remaining. Driving a car is a huge responsibility and part of that responsibility is ensuring that your tires are in optimal driving condition. So if you happen to be getting close to that time when you should have your tires replaced then a good are a pair of tires to consider are Nankang tires.